Sourcing nutritional ingredients to help create a healthier world population: it’s a Bioriginal story that begins in the heart of Saskatchewan. 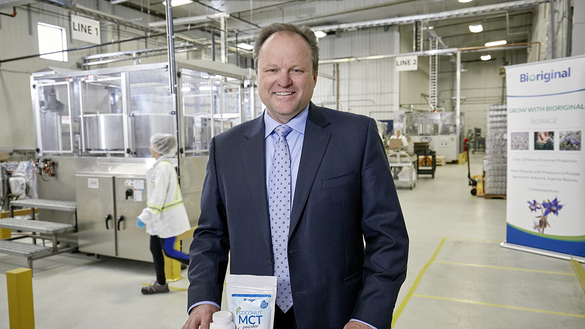 For 25 years, Saskatoon-based Bioriginal has been a global leader in delivering complete nutritional solutions to the food and nutraceutical industries, scientifically combining nutritional ingredients from all over the world—directly from the source— to create unique and successful solutions. Bioriginal was created through a merger of two like-minded companies. One company was established by the senior executive of a major food company in the U.S. who realized that there was a desire for more natural products in the market. He established a manufacturing operation in Saskatoon. The other company was a joint venture between the Government of Saskatchewan and the Saskatchewan Wheat Pool that aimed to find value-added crops for farmers. Vidal said the founders envisioned involving producers, manufacturers and marketers to produce an extensive range of products. In 1993, Bioriginal began producing its first ingredient, borage oil. Derived from the seeds of the herb plant Borago officinalis, borage oil has been used as a common herbal treatment in traditional medicine practices for hundreds of years to treat everything from skin flare-ups to respiratory infections. Vidal noted that since the crop grows well in a climate that has warmer temperatures during the day and colder temperatures at night, Saskatoon was the perfect growing region. However, the crop was not familiar to many farmers at the time, meaning an educational process was required. Around this time, the product was also relatively unknown in the marketplace. In 1998, Bioriginal launched its second omega ingredient, flaxseed oil, which is beneficial for heart health, digestive health and skin health. Around this time, Bioriginal also recognized the potential of omega-3 fish oil. This product helps maintain and support a healthy heart and can lower blood pressure and reduce the likelihood of heart attack and stroke, among other benefits. Bioriginal sourced fish oil from a company in Norway and started selling the product. In 1998, Bioriginal implemented blending technology in its manufacturing facility and became the first company in North America to develop omega 3-6-9 supplements: a blend of oils from borage, flax and fish. Bioriginal has a team of scientists and experts in the fields of nutrition, product development and marketing that tries to anticipate where the market is headed and formulates and creates products to meet the demand. “To sell these products, we had to visit customers in their sites and talk with their staff in the R&D, product development and marketing divisions, and explain why there’s a market for this product,” Vidal said. With an increasing list of omega ingredients in its portfolio, Bioriginal has expanded its producer network over the years and continues to work closely with suppliers from around the world. The company has also expanded into international markets beginning at the turn of the 21st century through strategic purchases and new product development. Bioriginal established an office in the Netherlands in 2000 to provide customized omega products to countries in Europe. In 2006, Bioriginal invested in a fish oil manufacturing facility in Peru to gain access to Peruvian aquaculture and maintain control of the quality of oil it provides to customers. Around this time, Bioriginal also initiated research on more palatable delivery formats for omega fatty acid consumption, since many customers dislike the taste and smell of omega oils. In 2008, Bioriginal launched omega products in the form of emulsions and chewables – products that are both tasty and successful. Today, Bioriginal has offices and facilities in Canada, United States, Netherlands and China, developing and distributing an expanding line of plant and dairy proteins, plant and marine oils and nutraceutical products to business customers worldwide. Vidal said that Bioriginal is eyeing continued growth in the future, especially in Asian markets.